Stellar Four: Happy 50th Birthday to "A Wrinkle in Time"
Happy 50th Birthday to "A Wrinkle in Time"
This year marks the 50th anniversary of one of the seminal works of children's science fiction: Madeleine L'Engle's A Wrinkle in Time. There are many reasons that this book has remained on reading lists and childhood bookshelves for half a century; here are a handful that resonate for me. The original hardback cover from 1962. 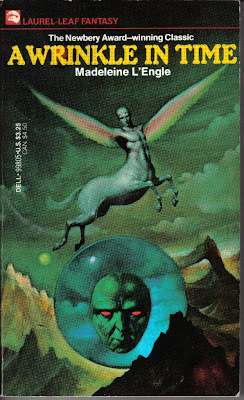 A Wrinkle in Time has a special place in the hearts of many readers because it was one of the first science fiction books they read as a child. That was true for me, and I'd hazard a guess that it's the same for many of you, too. It's the kind of book that opens readers' eyes to the possibility of vast new worlds, and they want to share it. Children pass it along to their friends and siblings. Those children then grow up to become parents, teachers and librarians, who make a point of putting Wrinkle into the hands of the next generation. I hope the cycle will continue for another 50 years. A Wrinkle In Time is a book full of Very Big Ideas. The immensity of the battle Meg, Calvin and Charles Wallace must fight seems overwhelming as they take on all-powerful evil with only the force of their goodness. Sure, good-versus-evil is a tale as old as time, but for many of the kids reading Wrinkle, it's their first exposure to that Voldemort-type malice. But the big ideas don't stop there. You've got children traveling through the universe by folding the fabric of space and time. (Is it any wonder I grew up to be a Doctor Who fan?) You've got pit stops on fantastical otherwordly planets where the creatures don't have eyes. Meg expresses shock that the eyeless Aunt Beast doesn't know what she's missing because she doesn't understand the concept of sight. As an 11-year-old reading the book, this Blew. My. Mind. I mean, what if we're missing a sense that's rudimentary to another species but that we can't even begin to understand? What beyond sight, sound, touch, taste and hearing could there be? I can't even fathom it today, and L'Engle had me pondering it 20-some years ago. The '80s-tastic cover Sara owned. Meg Wallace is a heroine to aspire to. She's a smart girl being raised in a loving family that values education and intellect, although she doesn't always apply herself and is a bit of a troublemaker at school. She is described as plain and, while she longs to be beautiful, she didn't obsess about it or let it turn her into a mopy, self-pitying monster. She stubborn and practical and brave, and she embarks on a mission to save not just her father but the entire universe from an untold evil. We need more Megs in our literature. A Wrinkle in Time is the first in a series of books that L'Engle wrote to tell the tales of the Wallace family. Each book has its own big ideas that are thought-provoking and immersive, sweeping young readers away to exotic lands and new adventures. It's a lucky boy or girl who falls in love with Wrinkle and goes on to read A Wind in the Door, A Swiftly Tilting Planet, A Ring of Endless Light and all the others. Sure, you can quibble with the book on a couple of points. I reread it as an adult and was surprised at how obvious the "Communism is bad, mmmkay?" conclusion feels to the grown-up reader. Other critics are uncomfortable with the religious overtones in the book. Still, the broader themes of love and light triumphing over conformity and darkness, placed in a novel with such wildly imaginative characters and settings, make it a book worth reading and sharing well into the 21st century. For more on A Wrinkle in Time's 50th anniversary, you can read NPR's story on the struggle to get it published, Publisher Weekly's reporting on the panel honoring the book, and A Reading Odyssey's rundown of the different covers that have graced the book over the years. And if you haven't read the children's book When You Reach Me by Rebecca Stead, which is hugely inspired by Wrinkle, I urge you to pick it up immediately. It's a children's book, but it's a satisfying mind-bender. Was A Wrinkle in Time one of your beloved childhood books, or did you gravitate to other novels when you were young? I consider this book to be my "gateway" to science fiction and fantasy literature. Even have my original copy I bought way back when I was 11 (43 now! Yikes! )and my daughter is now reading it. I have gone over various plot points with her and she is enjoying it too. 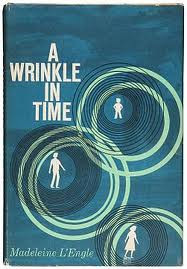 I have read A Wrinkle in Time only recently and absolutely loved it. I live in Germany, and it's not a classic at all here. It has only six reviews on Amazon, that's how small it is. Sometimes I feel like I live in a parallel universe (just like in Fringe where everything looks almost the same - but then there's no coffee). I haven't visited the site in years and the first article immediately reminds me of one of my favourite t-shirt sites where you can get the cover as a T-shirt (I'm not affiliated).